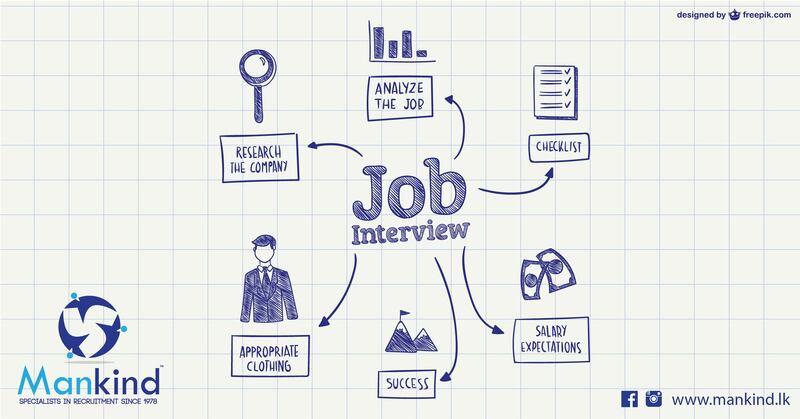 5 TIPS TO HELP YOU NAIL THAT JOB INTERVIEW! Interviews. The word alone is enough to send shivers down your spine. While some of us seem to breeze through them with an exceeding amount of confidence, the other half of the spectrum wishes a doppleganger could do the job for them. Unfortunately, parallel universes are still a theory so this is not really an option! A better idea would be to challenge yourself, face your fears, and tell yourself that you will give it your absolute best shot and better yet, secure that position. Believe it or not there are some very simple things that people tend to overlook during the process which can either make it or break it for you. For those of you who have been anxiously twiddling your thumbs dreading that upcoming interview, perhaps these stress-busters from Mankind.lk should help you take a deep breath. First of all, do not panic. Keep calm. Just as in any emergency situation if you lose your head there is really nothing useful you can accomplish other than make things significantly worse. By forcing yourself to relax, you are allowing your brain to think clearly, make rational decisions as well as act like a responsible human being. Once you get that much anticipated call, remember to speak coherently, to the point and politely. Then begin your preparation process. In Sri Lanka, it is quite common for the whole family to get worked up about an interview which only makes you feel even more pressured, which is why our advice is to try to not let it get to you! Just as you think you could not be more prepared for the interview, you are suddenly bombarded with a question that you suspect has an underlying motive but are not sure exactly what. A good example is when the interviewer asks you what you consider to be your negative traits. This throws most people off as your common sense tells you they most certainly do not want to hear you are weak or not suited for the job. So what do you do? Well, these are trick questions so the only way to answer, is with wit. We recommend that you turn the negative into a positive; for instance, you could say that you do not take much time for yourself because you cannot relax unless a project is seen through to the end. Voila, negative and positive in one! It is easy to get caught up in all sorts of stories when your interviewer asks you to tell them a bit about yourself, but once again you must remember you are applying for a job. They are not really looking for you to describe that time you spent with your aunt on a day trip to the hill country where you discovered a new type of flower. What they are looking for is information about the skills you have acquired in your previous positions that would help you do this job well. In short, what the company gains by employing you. Here, most people seem to make some of the most basic mistakes. You must always remember to dress for the job you want not what you feel like. Sure any day is a jeans and t-shirt type of day, but this would not really be received with much enthusiasm at an interview. It all boils down to preparation; if you feel that you do not have something appropriate to wear and if you have some time anywhere, hop into a shop to pick up an outfit. It need not be expensive, just relevant. It is incredibly important that if you are to show confidence, you must embody it. This is something invaluable not only for interviews but for life in general. It shows consideration for other people’s time as well as a want to work on a timely basis not to mention seriousness. Having said that, avoid getting there way too early; after all, your interviewer is a busy person and he might not appreciate being disturbed in a meeting just to come down and meet you. Around 15 minutes early is sufficient as it also gives you time to fill out any forms you need to. Unfortunately, we have had a lot of trouble not just getting people to show up for their own interviews, but even getting them to let us know early on if they cannot make it. In fact, we have noted 30% of no shows without the courteousy of informing either. Hence, we have now introduced a policy of blacklisting such candidates as it saves time for everyone, and also opens up doors for other potential applicants. Apart from the above technicalities, you should also remember to be very involved throughout the interview. Do not let your interviewer ramble on while you have your mind on your lunch. Listen carefully to whether the job is what you are expecting, what kind of pay they are willing to offer as well as what their working hours are. You can in turn ask any questions such as what their work culture is and any other information you would find useful such as the history of the company, additional benefits and the like. Remember you are not obligated to take up anything you are not happy with. Our team at Mankind.lk would like to stress that unless you have a dire urgency for money, use your knowledge, experience and skills where they will be truly appreciated. Good luck!